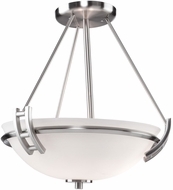 Ceiling Lights - Flush Mount & Semi-Flush Fixtures ~ Discount! 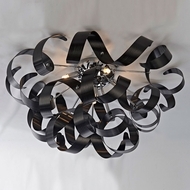 From the elegant to the sublime, our selection of ceiling lights rivals the senses and brings light and warmth to your home. 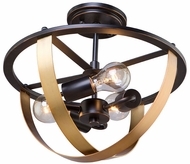 Popular subcategories include�Contemporary lighting,�Traditional lighting,�Tiffany lighting,�Rustic lighting, Flush Mount, and Semi-Flush (lights, recessed, and spot lights for illuminating specific areas. 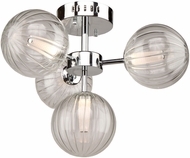 Kitchen light fixtures are also on hand, as well as fluorescent lights. 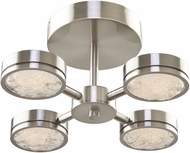 Depending upon your decor and style requirements, you are certain to find that special fixture here in our collection of affordable semi flush and flush mount ceiling lights. 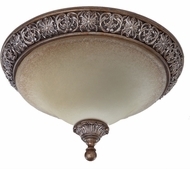 For overhead light that is soft and clear at the same time, use flush mount or semi flush style. 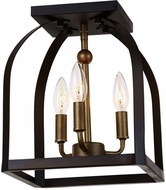 The variety of styles for our discount lights is limitless, as are the types of ceiling light we offer in our selection of discount semi flush ceiling lights. 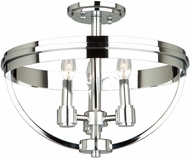 Buy flush mount fixtures that you will love and enjoy great prices on flush mount products. 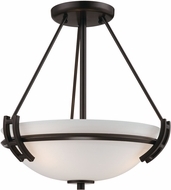 Take your pick of drop ceiling, flush mount, semi-flush mounts, and even�pendant�or recessed lights to create an overhead theme in your home. 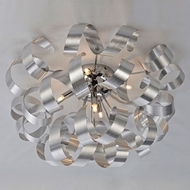 Ceiling lights are much more versatile than you might think. 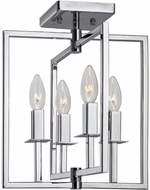 You can add to the overall ambiance of your home d�cor by installing models that includes a dimmer, extra brightness, or even a remote control. 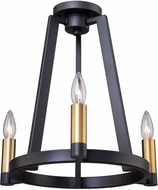 While task and accent styles might be sufficient to illuminate a small area and create a mood, overhead ceiling models are the best way to make sure that light reaches all parts of your living space unencumbered, because of the wide reach of ceiling lights, flush mount and semi-flush mount included. 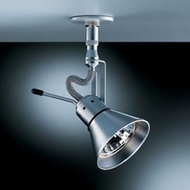 For the interior decorator and design DIYer, there is no limit on the number of styles available in the ceiling light world of flush fixtures and semi-flush ceiling lights. 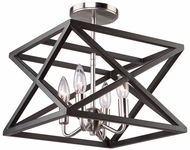 To create a more traditional, Gothic look, consider ornate, Victorian ceiling lights from our discount fixtures feature lots of subdued tones and ornate accents. For a livelier motif, look into lights that have a tropical or oriental theme, or incorporate Tiffany glass into their construction. 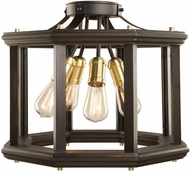 For a more comfortable, cabin-type vibe, rustic and Craftsman light fixtures are definitely the way to go.�Contemporary lighting�also abounds with options, integrating simple, geometric structures with sleek elemental finishes; and for the sea captain in all of us, nothing quite compares with the rare, but beautiful nautical light fixtures. 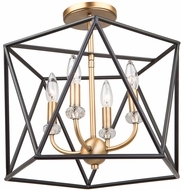 Ceiling lights are appropriate in any room of the house, so don’t overlook lighting opportunities in your bathroom, bedroom, dining room, or foyer. 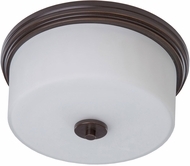 Flush mount solutions are particularly suited to these applications. 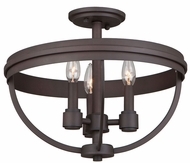 You’d be surprised how much adding a bit of gentle, overall illumination with flush mount fixtures can warm up a room and brighten the mood. 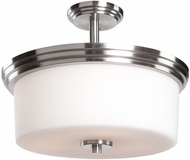 In kitchens and dining rooms, kitchen ceiling fixtures combined with�under cabinet lighting�can really liven up the decor and provide the added function of making kitchen utensils and food much easier to see because of the light from the best flush mount models. In bathrooms, the added overhead light will make shaving and makeup application much clearer, especially on those early mornings before you’ve had your first cup of coffee. And in the bedroom, choosing clothes for work or relaxing to watch a good movie or book before bed will strain your eyes much less if you install an overhead light on the ceiling. 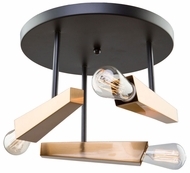 Light can be founded in the simplest places, and sometimes the most obvious choice (for example, from a ceiling fixture or flush ceiling light) is the best. 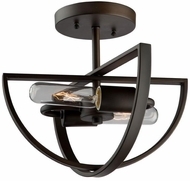 Because there are so many available styles and designs, people often overlook another important element in home lighting technology�energy efficient lighting. 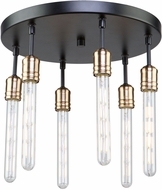 For those trying to “go green” and incorporate environmentally friendly appliances into their decor, choosing fixtures that are fluorescent, low voltage, Energy Star rated, or�LED lights�is a great way to brighten up any space but save electricity and the environment as well. 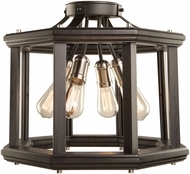 Energy saving fixtures are not only trendy and modern, but are certainly a more practical way to light your home in style. 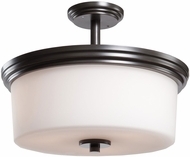 Our best discount fixtures include many energy efficient flush mount and semi-flush ceiling fixtures.